For the past 2 months we have been working at a furious pace to bring you awesome new features in WorksheetCloud that are going to make life as a parent a little easier! Unofficially dubbed “WorksheetCloud 1.1”, we’ve included an array of new tools in your WorksheetCloud Parent Account that will help you keep track of your child’s progress and notify you of areas of work that your child needs to focus more attention on. Every time you sign in to your WorksheetCloud account, you’ll be presented with a summary snapshot of your child’s progress. This includes their grade average, number of worksheets completed, and a breakdown of overall results per subject in a handy little graph. 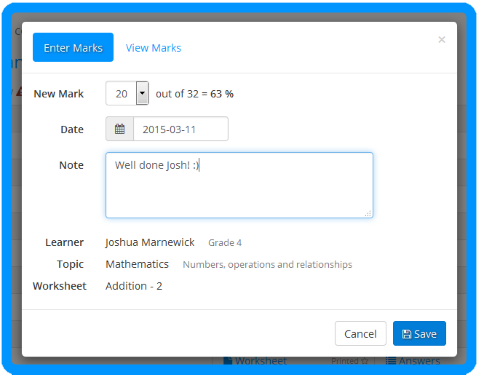 You can now enter your child’s mark for each worksheet that they complete. Once you’ve entered the mark, WorksheetCloud starts keeping track of the content your child has completed and compiles their results into a report card that shows you strong and weak areas. Marks for each worksheet are now displayed alongside the worksheet so that you can get a quick overview of how your child is performing in each topic for each subject. Plus, we notify you of all topics where the average mark is below 50%. This helps you quickly identify which topics your child should be focusing on. You can now get a full report on every worksheet your child has completed, including the highest mark, lowest mark, and latest mark plus the average across all worksheets. Again, the purpose is to help you determine what topics and subjects your child needs to spend time revising and practising. Have we hit the nail on the head? Share your comments, thoughts and questions about our new features in the comment box below. If you haven’t enrolled your child for WorksheetCloud yet, we suggest you take a product tour immediately. You don’t want to miss out.